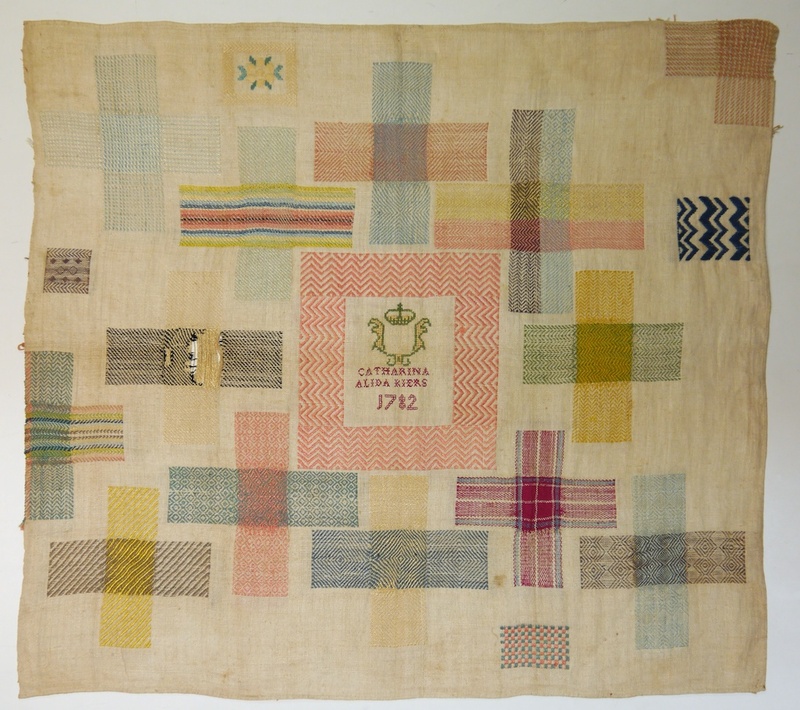 Last year I went to the Fries Museum to see their collection of darning samplers. 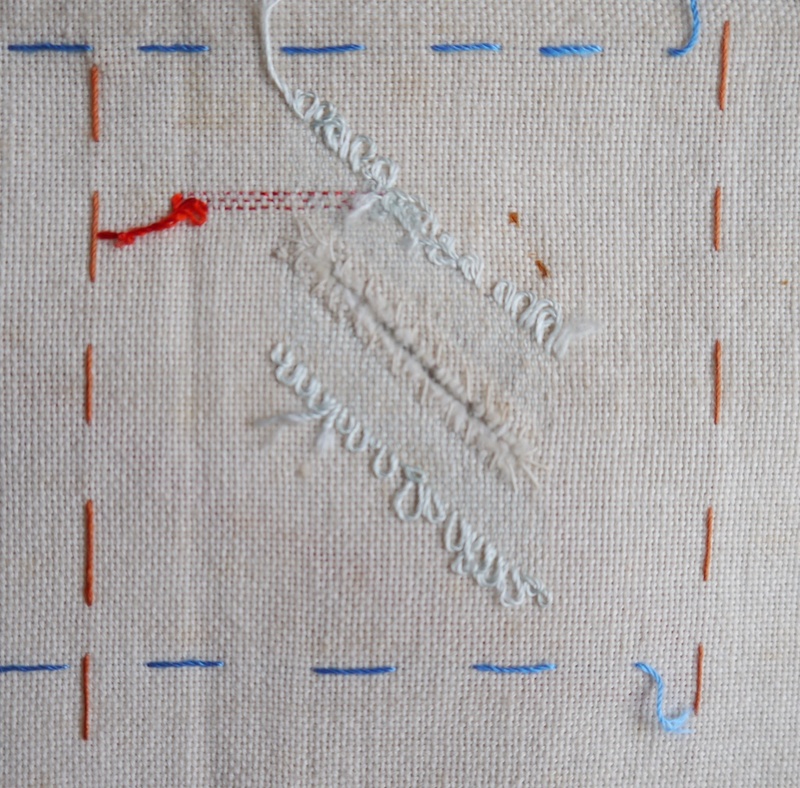 Little did I know that almost a year later, I would own my own antique darning sampler. Note: if you want to see the following pictures in close-up, simply click on them to see the larger version. 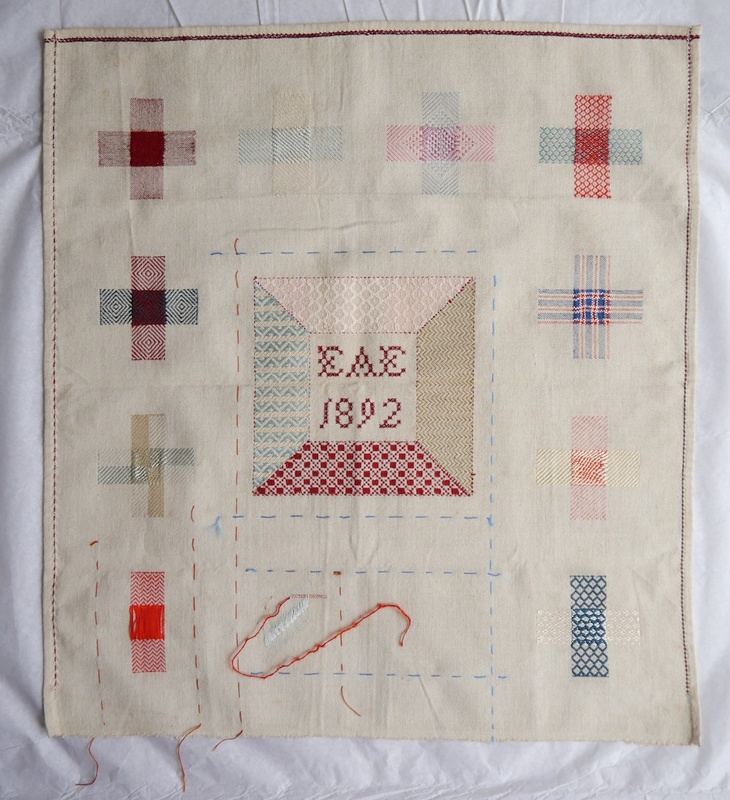 A good excuse to read up on darning samplers and I’d like to share with you some of the things I’ve learnt. 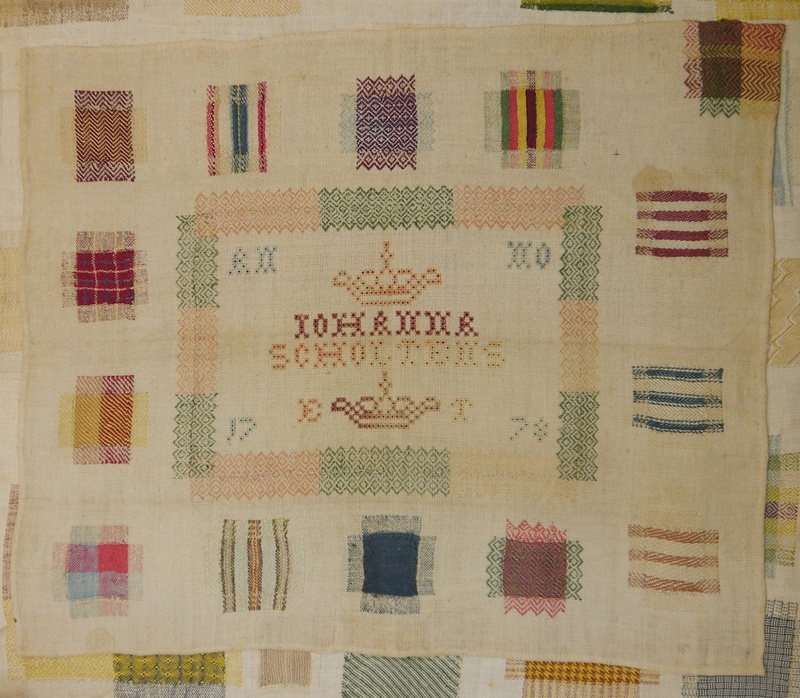 Making darning samplers seemed to be particularly popular in The Netherlands, although you find them also in other countries. 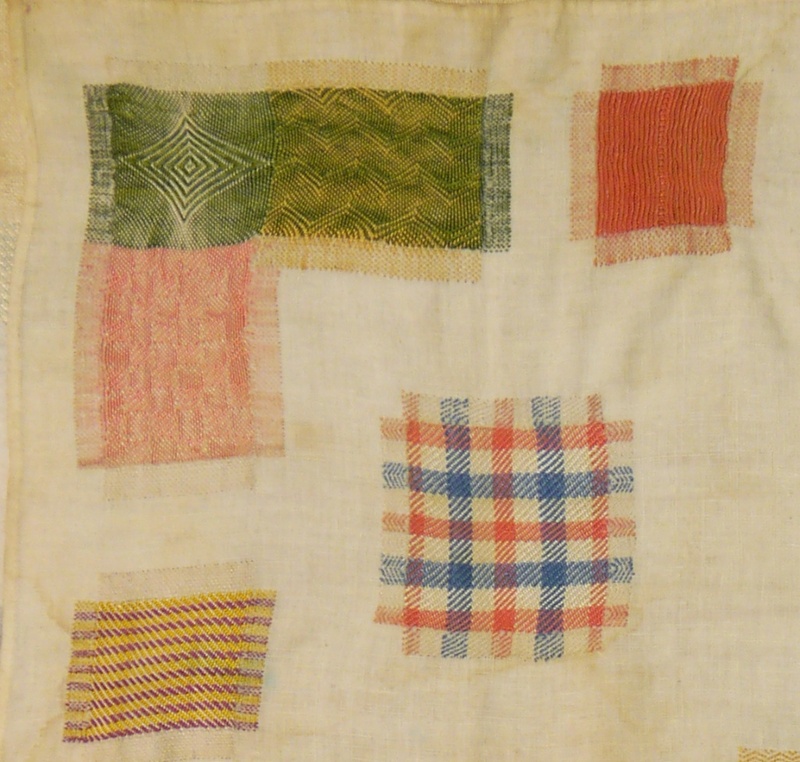 What follows comes from Dutch books that specifically talk about darning samplers (listed below) and reflect how things were in The Netherlands; I can only assume things might’ve been similar elsewhere. 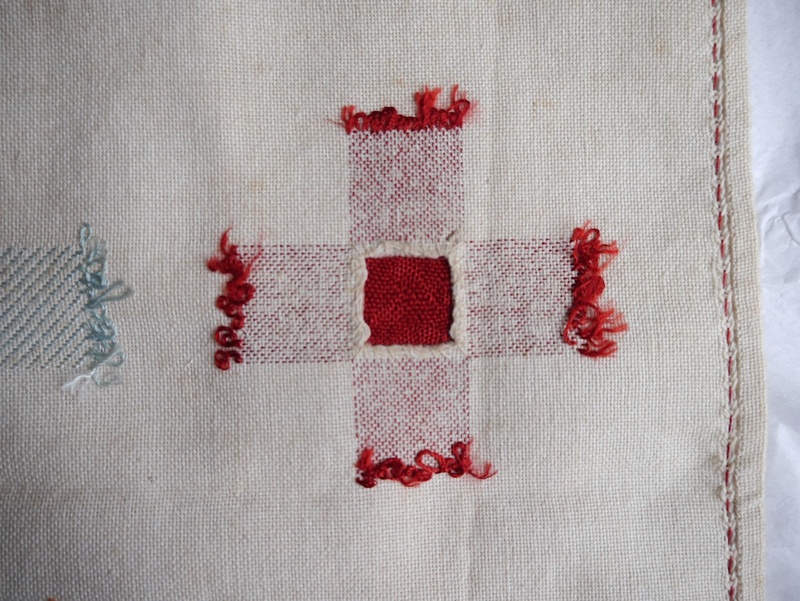 Darning samplers seem to have been part of any girl’s education, rich or poor. All women were supposed to help out with household tasks, which included maintenance of clothes and linens. 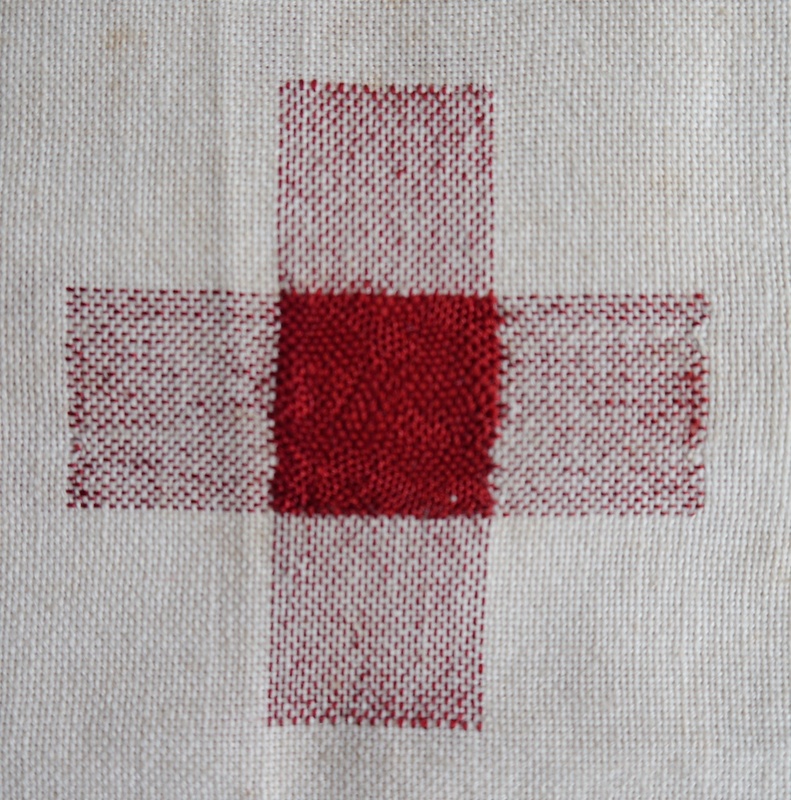 Girls and women ought to keep themselves occupied with useful things, and for those who needed to supplement their income, needlework was a respectable way of earning some extra money. 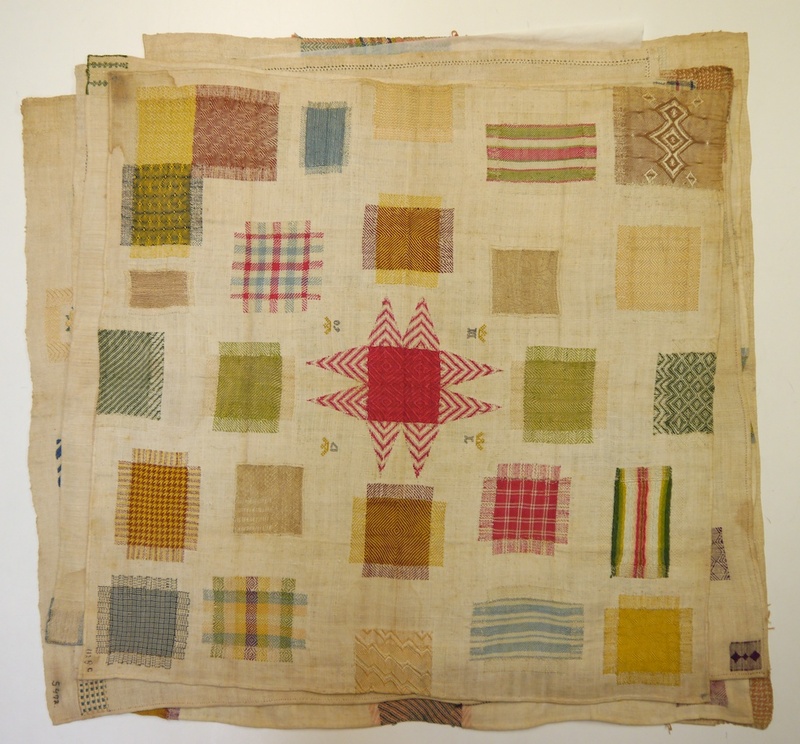 Girls were often sent to a small girls’ boarding school (they were often called “French Boarding School” as the girls were also taught French), where needlework was part of the curriculum. It was also taught at orphanages to ensure orphaned girls would be able to look after themselves once they left. For those girls who were too busy during the day (they might have a job as a maid, or help run a household), there were also evening darning and sewing classes. Needlecraft lessons included embroidery, knitting, sewing, and mending. 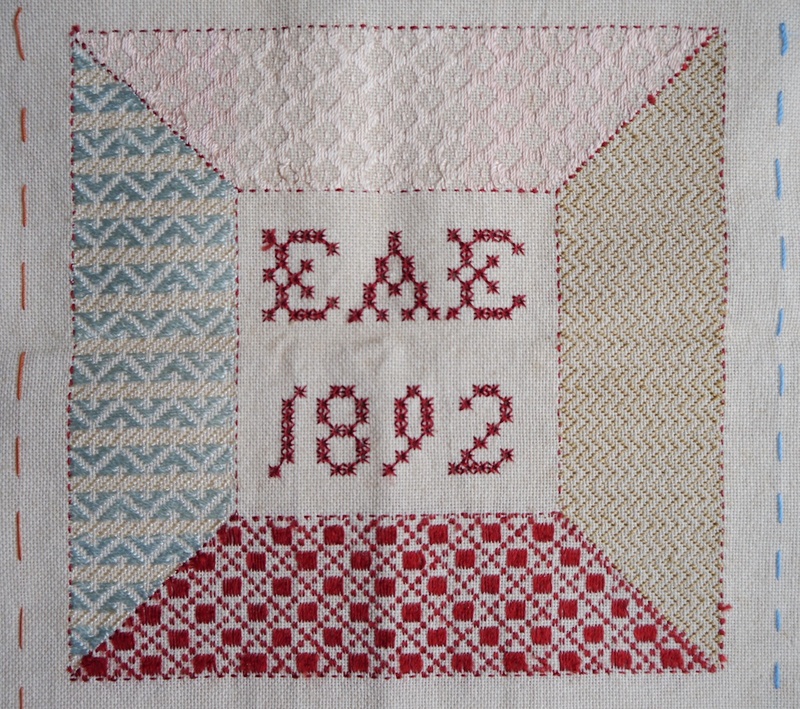 Often girls started with a cross stitch sampler, practising the letters of the alphabet. 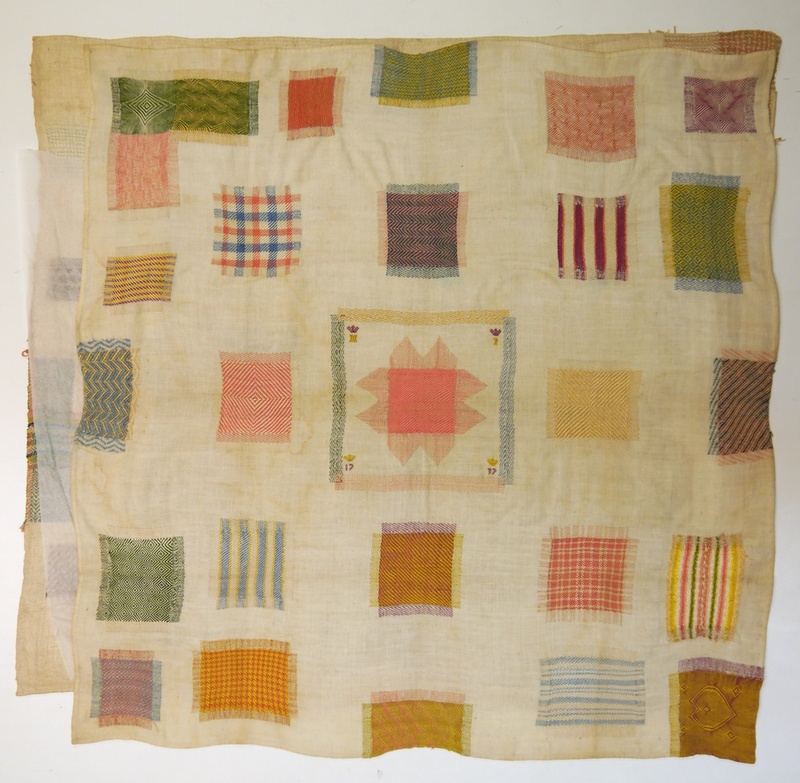 Many households sent their laundry to the laundry house and by marking all the linen, they could all be returned cleaned and bleached to the rightful owners. 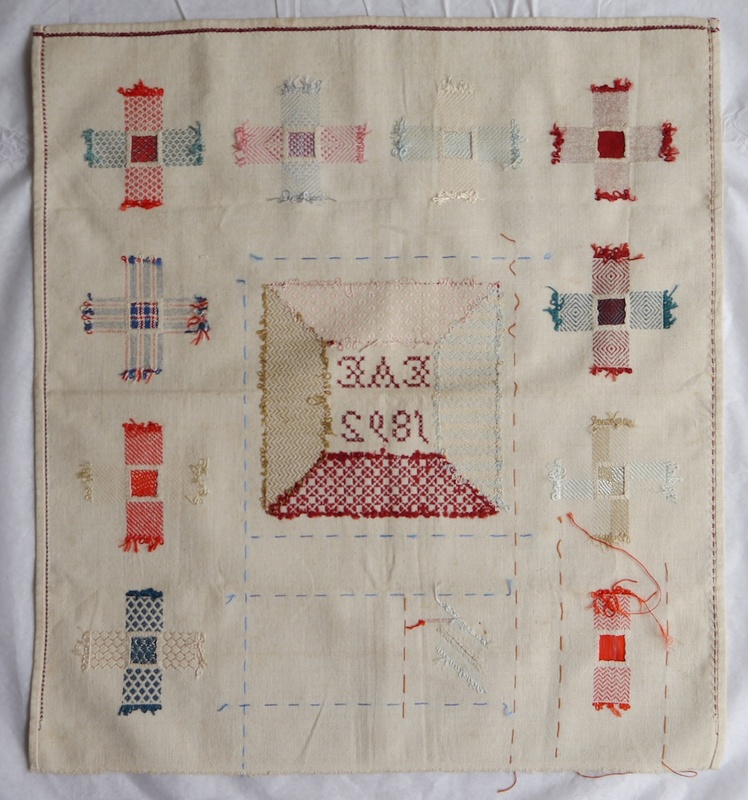 Often these samplers started with the alphabet repeated a few times (making sure the letters were embroidered exactly the same and lined up: an exercise in counting the threads), and then little motifs were added, which could be used for decorative purposes. 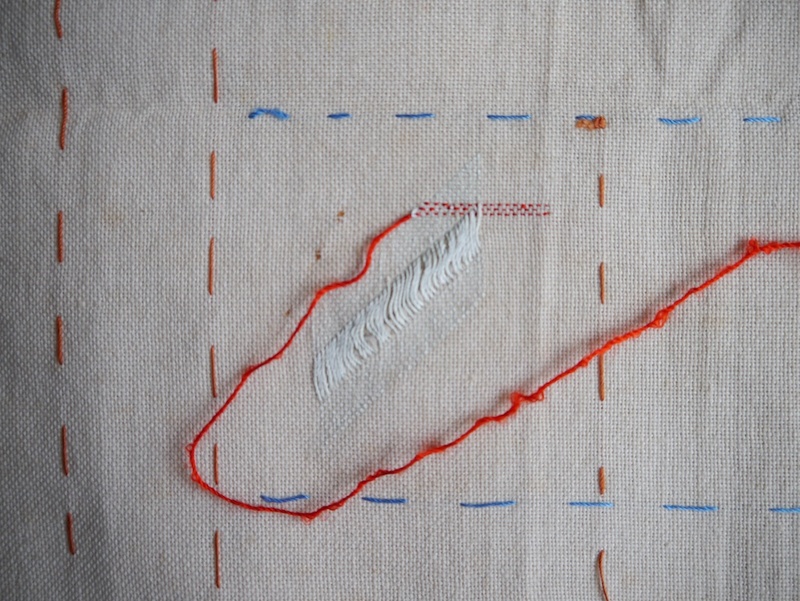 As I understand it, girls started with the easier embroidery sampler first, and then moved on to the darning sampler. 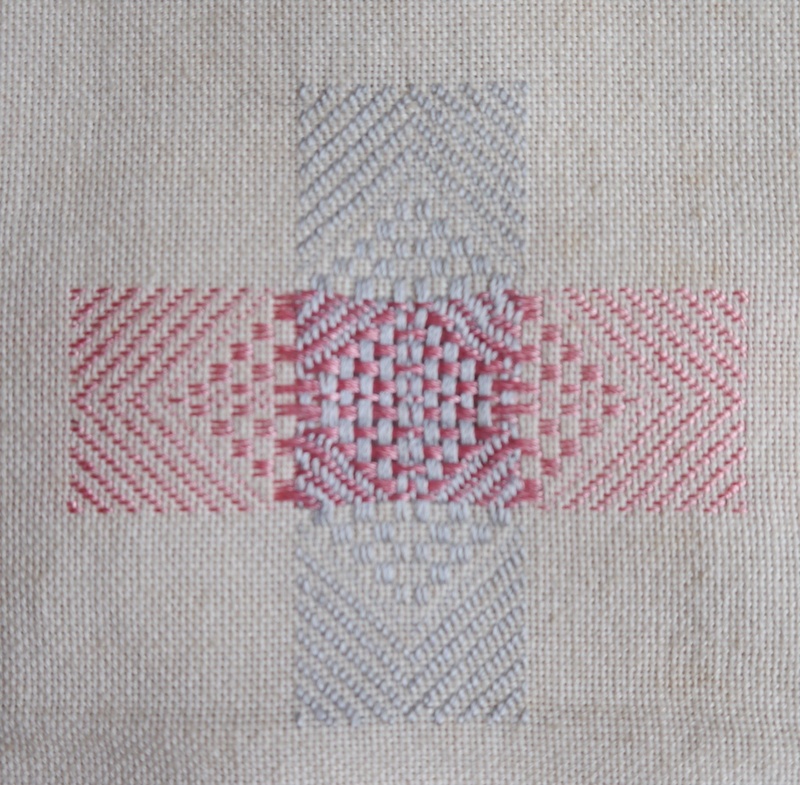 And in the darning sampler there was also a build-up of complexity in technique. One started off with damask darning, which is nowadays still used as a decorative technique. This simply required the darner to pick up threads from the sound fabric. 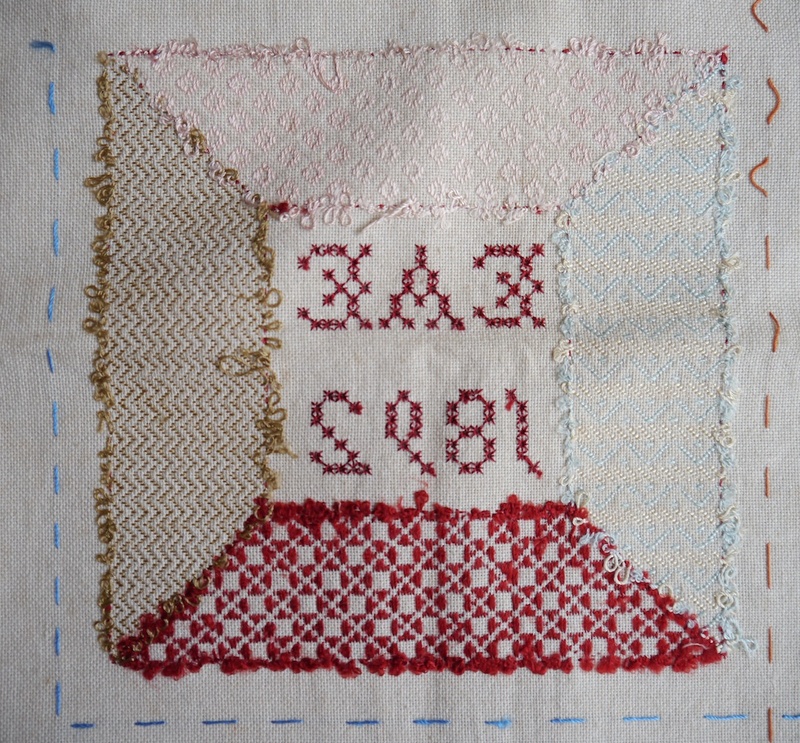 You can see this in the centre square of my sampler: each of the borders show a different damask darning pattern. After the damask darn they moved on to the real deal: darning across an actual hole. A hole was neatly cut out and the edges whipped to stop them from fraying. First all the vertical threads (the warp, so to speak) were put across the hole by starning some simple damask darning a bit away from the hole, span the thread across the hole and then darn in a bit more on the other side. When turning direction to work back, a little loop was left at the end. Used linen was usually washed a lot, so wouldn’t shrink anymore, but the new darning thread used for the repair would shrink upon the first wash, so these loops allowed for that. The horizontal threads were woven in in a similar fashion, weaving them over and under the warp threads. 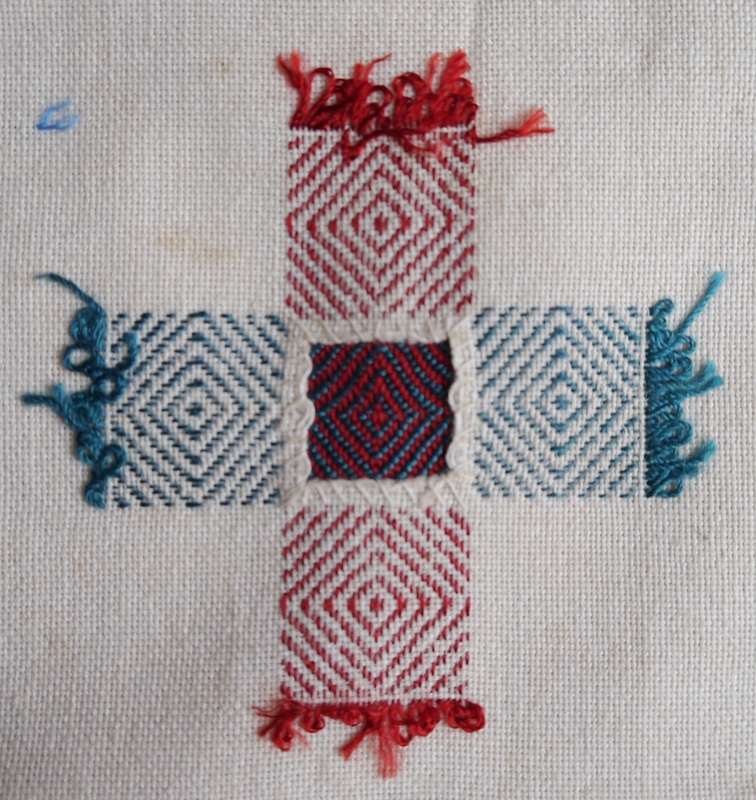 The first hole (top right in my sampler) would be done in a simple even weave, and then slowly the complexity increased to other weave patterns, such as twill weaves, bird’s eye, satin, and checks. Colours and materials for repair change through the centuries according to fashion. These practice darns were usually done in coloured threads on a plain white or unbleached ground, so that it was easy to see what you were doing, but also allowing the teacher to spot any mistakes more readily. 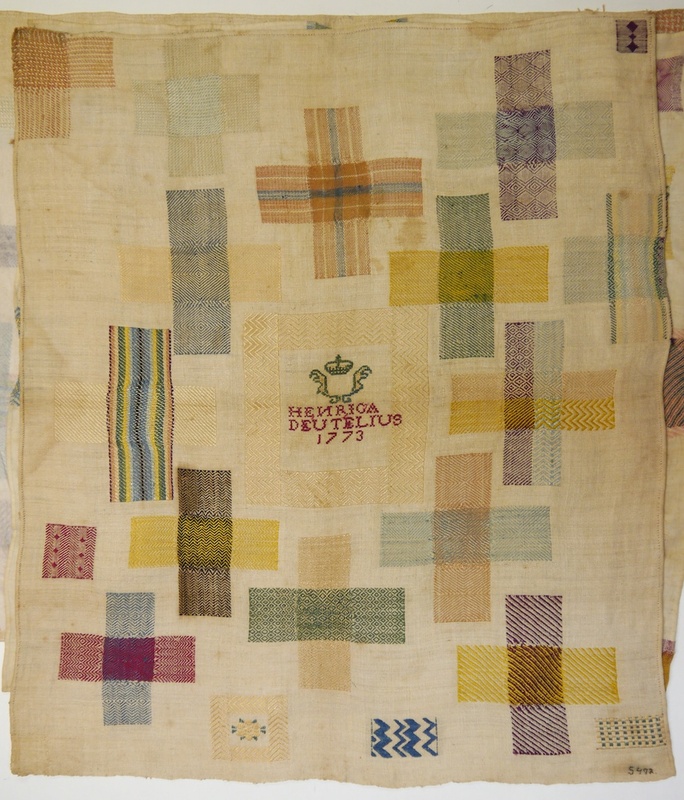 Old darning samplers often used fine silks, linen or cotton threads on a linen or cotton ground. Less common was the use of wool, although it became more popular when the ‘Berlin wools’ came into fashion for needlepoint. 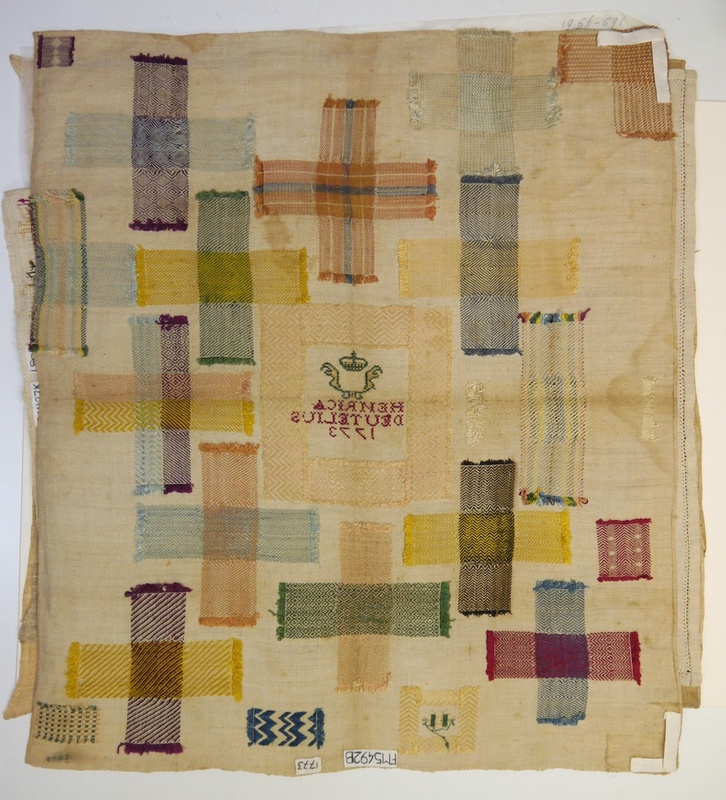 Older darning samplers were often executed with very fine threads, and the holes repaired were rather large and therefore presented a real challenge. The threads used are slowly getting a bit less fine, and likewise the fabric used became coarser throughout the centuries; the variety of techniques seemed to go down as well. Old darning samplers included complex repairs at the edge of the fabric, and the most difficult of all was the darning of a corner. A length of ribbon or tape was used as a corner edge, which was sometimes removed after the darn was completed. Later darning samplers don’t show these complicated repairs, and also the size of the holes to be darned became smaller. This could be due to a number of reasons, but one of them is that for larger holes and corners a sewn-in patch is a much stronger repair than a hand-sewn darn could ever be. My darning sampler seems to be typical of its time: no complex edge or corner darns, and none of the holes are larger than 3x3cm. For whatever reason, this one was left unfinished. One darn in the lower left corner only has the warp threads darned in in a herringbone pattern, and there also the start of repairing a diagonal slash. This repair was complicated, as the edges of the slash are on the diagonal, so liable to stretch out. 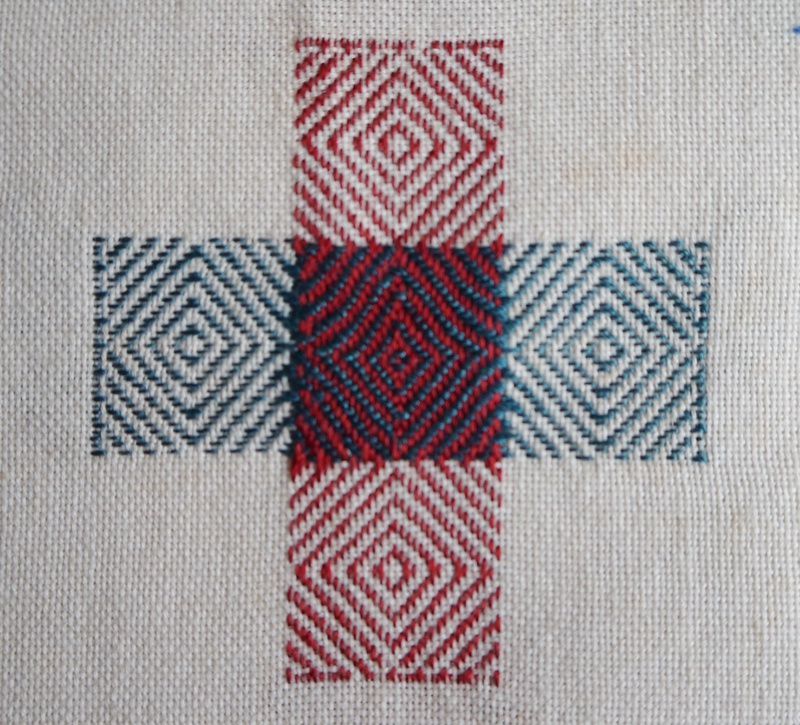 This darning sampler would’ve been worked on over a good few months. 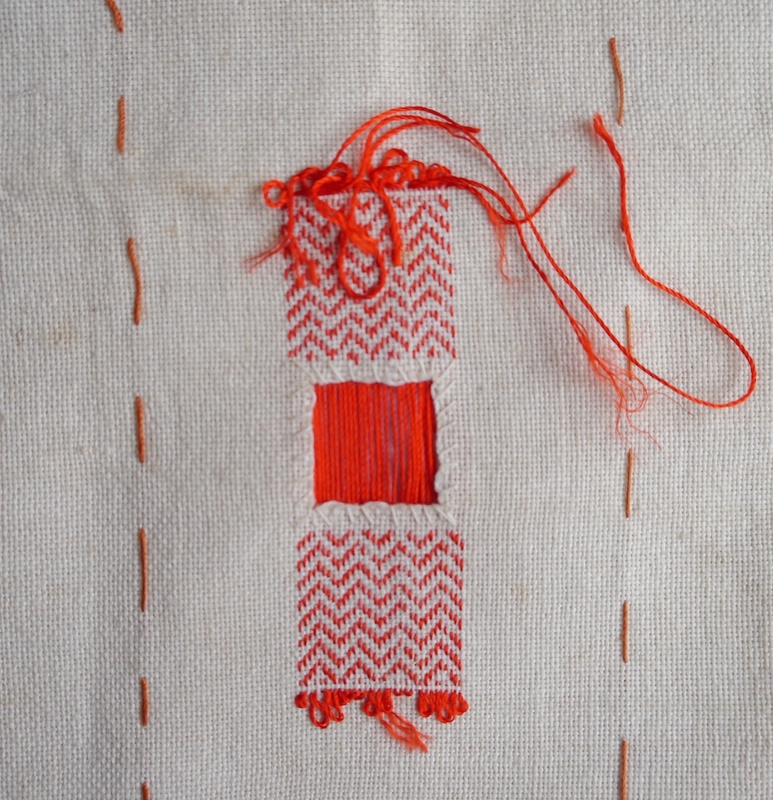 Girls would usually have darning lessons a few hours a week, and it took them about a year to complete a sampler. I will never know why my darning sampler was never finished, but the research in the books I have show that often girls either couldn’t afford the fees, or were not able to attend classes due to other duties taking higher priority. In the country side for instance, there were no lessons during harvest time as everybody, young and old, had to help bring in the harvest. The mystery remains, and that is part of the beauty of it. 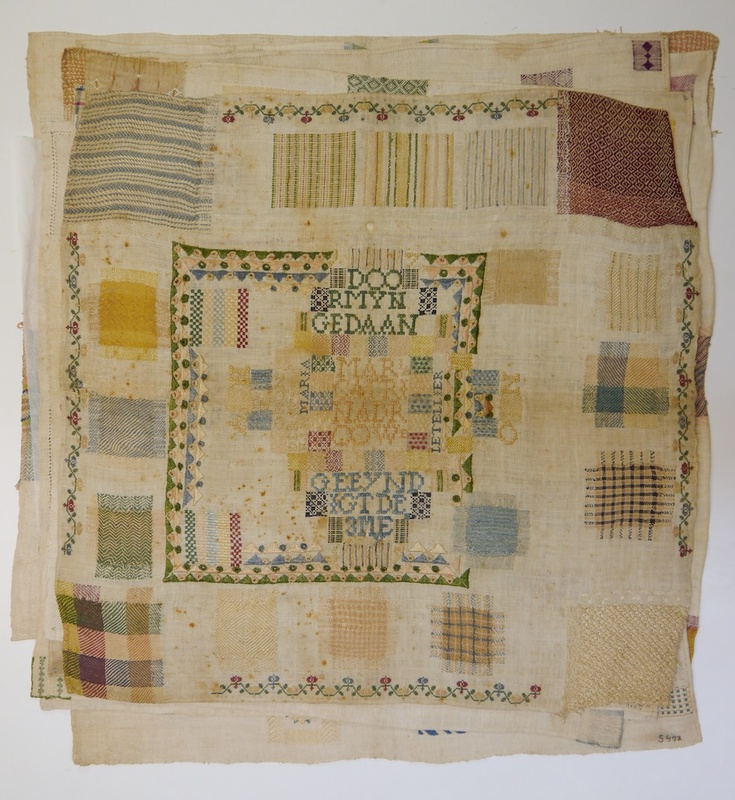 Even if I don’t know a thing about who made this sampler or why it was never completed, it represents an important part of young women’s social history, and will provide me with food for thought and inspiration for years to come. Kipp, A; Schipper-van Lottum, MGA; Van der Vlerk, L. Nuttig en Fraai; Zuidhollandse merk- en stoplappen. Becht, Haarlem, 1987. Schipper-van Lottum, MGA. Stop- en borduurlappen; geschiedenis en techniek. Becht, Haarlem, 1987. Smith-Sanders, B. Merk- en Stoplappen uit het Burgerweeshuis Amsterdam. Venlo, 2013.